ecorn-cf: lt Vaidutis Kučinskas, Prof., Ph.D., Dr. Habil. 1977–1985; Research Institute of Experimental and Clinical Medicine (Vilnius); Head of the Laboratory of Medical Genetics. 1970–1977; Vilnius Republican Hospital; Head of the Genetic Counselling Office. 1985–1990; Research Institute of Mother and Child Care (Vilnius); Head of the Dept. of Medical Genetics. 1985–1990; Vilnius Republican Clinical Hospital (Vilnius); Director of Medical Genetics Centre. 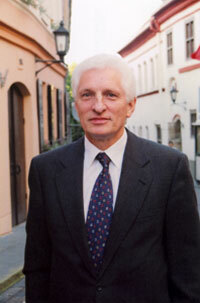 1991–2002; Vilnius University, Faculty of Medicine (Vilnius); Professor, Head of Human Genetics Centre. 1991–2002; Vilnius University Hospital Santariški? klinikos (Vilnius); Professor, Director of Human Genetics Centre. 2002–present; Vilnius University, Faculty of Medicine (Vilnius); Professor, Chairman of Department of Human and Medical Genetics. 2002–present; Vilnius University Hospital Santariški? klinikos (Vilnius); Director of the Centre for Medical Genetics, medical geneticist. Courses of lectures on human, clinical and population genetics at Vilnius University (Faculty of Medicine, Faculty of Natural Sciences, Faculty of Philosophy). Guidance of bachelor and master of science work. 2003; First degree award of the Ministry of Science and Education of the Republic of Lithuania for the textbook Kucinskas V. Genetics (Genetika). 2001 (in Lithuanian). 2003; Second degree award of the Ministry of Science and Education of the Republic of Lithuania for the co-authorship of textbook Children Diseases (Vaik? ligos) (Ed. A. Raugale). 2001 (in Lithuanian).